Make any little girl’s birthday party even more purrfect by hanging up this adorable Hello Kitty Pinata. 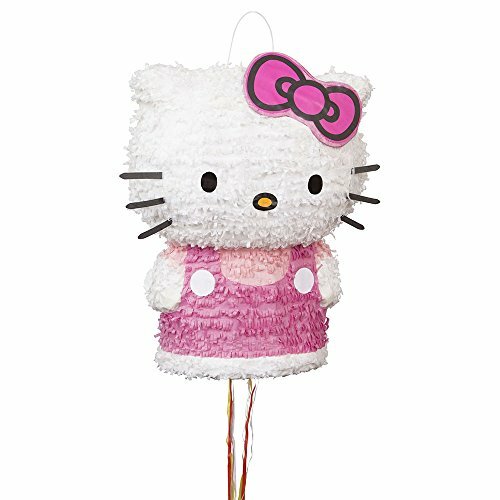 Designed to look just like the iconic Sanrio feline who has been a hit with little girls for over 40 years, this party pinata makes a darling addition to any Hello Kitty party. Simply fill this birthday pinata with candy and other sweet surprises (sold separately), attach it to the ceiling, and let little girls take turns pulling the attached strings to find the one that releases the goodies inside. Best of all, this kids pinata doubles as not only a fun and exciting party game, but also as a fun party decoration that will add instant Hello Kitty style to any birthday bash.